Carcinoma of the ampulla of Vater, shown in the image below, is a rare malignant tumor arising within 2 cm of the distal end of the common bile duct, where it passes through the wall of the duodenum and ampullary papilla. 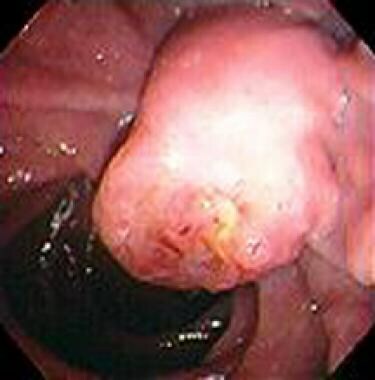 Endoscopic view of an ampullary carcinoma. The common bile duct merges with the pancreatic duct of Wirsung to form a common channel that exits through the ampulla into the duodenum. The most distal portion of the common bile duct is dilated (ie, forms the ampulla of Vater) and is surrounded by the sphincter of Oddi, which spirals upward around the terminal portion of the duct. Carcinoma of the ampulla of Vater tends to manifest early due to biliary outflow obstruction, as opposed to pancreatic neoplasms that often are advanced at the time of diagnosis. Clinically, however, ampullary tumors can be virtually indistinguishable from tumors of the distal bile duct or pancreatic head; the point of origin of tumors in this region is typically not determined until the patient undergoes surgery. Pancreaticoduodenectomy is the standard resection procedure for ampullary carcinoma. When preoperative endoscopic biopsy identifies a lesion as an ampullary adenoma with no high-risk features (eg, high-grade dysplasia), treatment with local resection (ampullectomy) may be considered, if the patient is not a candidate for pancreaticoduodenectomy. However, such patients require surveillance endoscopy to monitor for recurrence. Surgical resection with curative intent is the only option for long-term survival. Surgical, endoscopic, or radiologic biliary decompression; relief of gastric outlet obstruction; and adequate pain control may improve the quality of life but do not affect overall survival rate. Periampullary carcinoma includes tumors arising in the head, neck, or uncinate process of the pancreas, tumors arising in the distal common bile duct, tumors arising in the duodenum, as well as tumors arising from the ampulla of Vater. Lymph nodes metastases are present in as many as half of patients. Pericanalicular lymph nodes usually are the first to be involved. Nodes along the superior mesenteric, gastroduodenal, common hepatic, and splenic arteries, as well as the celiac trunk, are the second station of lymph nodes. Perineural, vascular, and lymphatic invasion are associated with a poor prognosis. Liver is the most common site (66%) of distant metastasis, followed by lymph nodes (22%). In advanced cases, lung metastasis also may occur. Worldwide incidence is not known. Operative mortality rates have decreased significantly over the last decade because of increased surgical experience, improved anesthesia, better preoperative imaging, and better postoperative management. Pancreatic fistulas, prolonged gastric emptying, wound complications, intra-abdominal sepsis, thrombophlebitis, and marginal ulceration are the most common complications. Postoperative mortality rates in the best centers are 1-2%. Ampullary carcinoma may be more common in whites than blacks. A higher rate of ampullary cancer is observed in men. Ampullary cancer is most often diagnosed in the fifth through the seventh decades of life. Albores-Saavedra J, Schwartz AM, Batich K, Henson DE. Cancers of the ampulla of vater: demographics, morphology, and survival based on 5,625 cases from the SEER program. J Surg Oncol. 2009 Dec 1. 100(7):598-605. [Medline]. Morini S, Perrone G, Borzomati D, Vincenzi B, Rabitti C, Righi D, et al. Carcinoma of the ampulla of Vater: morphological and immunophenotypical classification predicts overall survival. Pancreas. 2013 Jan. 42(1):60-6. [Medline]. Wakasugi M, Tanemura M, Furukawa K, Murata M, Miyazaki M, Oshita M, et al. Signet ring cell carcinoma of the ampulla of vater: Report of a case and a review of the literature. Int J Surg Case Rep. 2015. 12:108-11. [Medline]. Carter JT, Grenert JP, Rubenstein L, Stewart L, Way LW. Tumors of the ampulla of vater: histopathologic classification and predictors of survival. J Am Coll Surg. 2008 Aug. 207(2):210-8. [Medline]. Husain S, Ahmed L, Al-Sawwaf M. Venous air embolism from intravenous CT contrast administration. J Am Coll Surg. 2006 Jan. 202(1):197. [Medline]. Cameron JL. One thousand consecutive pancreaticoduodenectomies and beyond: a personal series. Am J Surg. Oct 2007. 194:S11-S15. Yeo CJ, Sohn TA, Cameron JL, Hruban RH, Lillemoe KD, Pitt HA. Periampullary adenocarcinoma: analysis of 5-year survivors. Ann Surg. 1998 Jun. 227(6):821-31. [Medline]. [Full Text]. Talamini MA, Moesinger RC, Pitt HA, Sohn TA, Hruban RH, Lillemoe KD. Adenocarcinoma of the ampulla of Vater. A 28-year experience. Ann Surg. 1997 May. 225(5):590-9; discussion 599-600. [Medline]. Hornick JR, Johnston FM, Simon PO, et al. A single-institution review of 157 patients presenting with benign and malignant tumors of the ampulla of Vater: management and outcomes. Surgery. 2011 Aug. 150(2):169-76. [Medline]. [Full Text]. Burke CA, Beck GJ, Church JM, van Stolk RU. The natural history of untreated duodenal and ampullary adenomas in patients with familial adenomatous polyposis followed in an endoscopic surveillance program. Gastrointest Endosc. 1999 Mar. 49(3 Pt 1):358-64. [Medline]. Griffioen G, Bus PJ, Vasen HF, Verspaget HW, Lamers CB. Extracolonic manifestations of familial adenomatous polyposis: desmoid tumours, and upper gastrointestinal adenomas and carcinomas. Scand J Gastroenterol Suppl. 1998. 225:85-91. [Medline]. Berndt C, Haubold K, Wenger F, et al. K-ras mutations in stools and tissue samples from patients with malignant and nonmalignant pancreatic diseases. Clin Chem. 1998 Oct. 44(10):2103-7. [Medline]. Iacono C, Verlato G, Zamboni G, Scarpa A, Montresor E, Capelli P, et al. Adenocarcinoma of the ampulla of Vater: T-stage, chromosome 17p allelic loss, and extended pancreaticoduodenectomy are relevant prognostic factors. J Gastrointest Surg. 2007 May. 11(5):578-88. [Medline]. Menzel J, Hoepffner N, Sulkowski U, et al. Polypoid tumors of the major duodenal papilla: preoperative staging with intraductal US, EUS, and CT--a prospective, histopathologically controlled study. Gastrointest Endosc. 1999 Mar. 49(3 Pt 1):349-57. [Medline]. John TG, Greig JD, Carter DC, Garden OJ. Carcinoma of the pancreatic head and periampullary region. Tumor staging with laparoscopy and laparoscopic ultrasonography. Ann Surg. 1995 Feb. 221(2):156-64. [Medline]. [Full Text]. Palta M, Patel P, Broadwater G, Willett C, Pepek J, Tyler D, et al. Carcinoma of the ampulla of Vater: patterns of failure following resection and benefit of chemoradiotherapy. Ann Surg Oncol. 2012 May. 19(5):1535-40. [Medline]. Willett CG, Warshaw AL, Convery K, Compton CC. Patterns of failure after pancreaticoduodenectomy for ampullary carcinoma. Surg Gynecol Obstet. 1993 Jan. 176(1):33-8. [Medline]. Bhatia S, Miller RC, Haddock MG, Donohue JH, Krishnan S. Adjuvant therapy for ampullary carcinomas: the Mayo Clinic experience. Int J Radiat Oncol Biol Phys. 2006 Oct 1. 66(2):514-9. [Medline]. Hsu CH, Chen TD, Tsai CY, Hsu JT, Yeh CN, Jan YY, et al. Prognostic Value of the Metastatic Lymph Node Ratio in Patients With Resectable Carcinoma of Ampulla of Vater. Medicine (Baltimore). 2015 Oct. 94 (42):e1859. [Medline]. Barton RM, Copeland EM 3rd. Carcinoma of the ampulla of Vater. Surg Gynecol Obstet. 1983 Mar. 156(3):297-301. [Medline]. Krishnan S, Rana V, Evans DB, et al. Role of adjuvant chemoradiation therapy in adenocarcinomas of the ampulla of vater. Int J Radiat Oncol Biol Phys. 2008 Mar 1. 70(3):735-43. [Medline]. Kim K, Chie EK, Jang JY, Kim SW, Oh DY, Im SA. Role of adjuvant chemoradiotherapy for ampulla of Vater cancer. Int J Radiat Oncol Biol Phys. 2009 Oct 1. 75(2):436-41. [Medline]. Overman MJ, Varadhachary GR, Kopetz S, Adinin R, Lin E, Morris JS. Phase II study of capecitabine and oxaliplatin for advanced adenocarcinoma of the small bowel and ampulla of Vater. J Clin Oncol. 2009 Jun 1. 27(16):2598-603. [Medline]. Yeung RS, Weese JL, Hoffman JP, et al. Neoadjuvant chemoradiation in pancreatic and duodenal carcinoma. A Phase II Study. Cancer. 1993 Oct 1. 72(7):2124-33. [Medline]. Ostojic SM, Knezevic DR, Perisic M, Jurisic V, Knezevic SM. The importance of choice of resection procedures in T1 and T2 stage of carcinoma of the ampulla of Vater. J BUON. 2015 Sep-Oct. 20 (5):1206-14. [Medline]. Giuliani J, Piacentini P, Bonetti A. Ampulla of Vater carcinoma in real-world clinical practice: a case series. Tumori. 2015 Jun 25. 101 (3):e75-8. [Medline]. Meneghetti AT, Safadi B, Stewart L, Way LW. Local resection of ampullary tumors. J Gastrointest Surg. 2005 Dec. 9(9):1300-6. [Medline]. Toh SK, Davies N, Dolan P, Worthley C, Townsend N, Williams JA. Good outcome from surgery for ampullary tumour. Aust N Z J Surg. 1999 Mar. 69(3):195-8. [Medline]. Sohn TA, Lillemoe KD, Cameron JL, et al. Reexploration for periampullary carcinoma: resectability, perioperative results, pathology, and long-term outcome. Ann Surg. 1999 Mar. 229(3):393-400. [Medline]. [Full Text]. Zhong J, Palta M, Willett CG, McCall SJ, Bulusu A, Tyler DS, et al. The role of local excision in invasive adenocarcinoma of the ampulla of Vater. J Gastrointest Oncol. 2013 Mar. 4(1):8-13. [Medline]. [Full Text]. Gurusamy KS, Kumar S, Davidson BR. Prophylactic gastrojejunostomy for unresectable periampullary carcinoma. Cochrane Database Syst Rev. 2013 Feb 28. 2:CD008533. [Medline]. Grobmyer SR, Pieracci FM, Allen PJ, Brennan MF, Jaques DP. Defining morbidity after pancreaticoduodenectomy: use of a prospective complication grading system. J Am Coll Surg. 2007 Mar. 204(3):356-64. [Medline]. el-Ghazzawy AG, Wade TP, Virgo KS, Johnson FE. Recent experience with cancer of the ampulla of Vater in a national hospital group. Am Surg. 1995 Jul. 61(7):607-11. [Medline]. Hartenfels IM, Dukat A, Burg J, Hansen M, Jung M. [Adenomas of Vater's ampulla and of the duodenum. Presentation of diagnosis and therapy by endoscopic interventional and surgical methods]. Chirurg. 2002 Mar. 73(3):235-40. [Medline]. Kennedy EP, Yeo CJ. Pancreaticoduodenectomy with extended retroperitoneal lymphadenectomy for periampullary adenocarcinoma. Surg Oncol Clin N Am. 2007 Jan. 16(1):157-76. [Medline]. Paraskevas KI, Avgerinos C, Manes C, Lytras D, Dervenis C. Delayed gastric emptying is associated with pylorus-preserving but not classical Whipple pancreaticoduodenectomy: a review of the literature and critical reappraisal of the implicated pathomechanism. World J Gastroenterol. 2006 Oct 7. 12(37):5951-8. [Medline]. Park JS, Yoon DS, Kim KS, et al. Factors influencing recurrence after curative resection for ampulla of Vater carcinoma. J Surg Oncol. 2007 Mar 15. 95(4):286-90. [Medline]. Rosen M, Zuccaro G, Brody F. Laparoscopic resection of a periampullary villous adenoma. Surg Endosc. 2003 Aug. 17(8):1322-3. [Medline]. Sarmiento JM, Nagomey DM, Sarr MG, Farnell MB. Periampullary cancers: are there differences?. Surg Clin North Am. 2001 Jun. 81(3):543-55. [Medline]. Todoroki T, Koike N, Morishita Y, et al. Patterns and predictors of failure after curative resections of carcinoma of the ampulla of Vater. Ann Surg Oncol. 2003 Dec. 10(10):1176-83. [Medline]. Van Heek NT, De Castro SM, van Eijck CH, et al. The need for a prophylactic gastrojejunostomy for unresectable periampullary cancer: a prospective randomized multicenter trial with special focus on assessment of quality of life. Ann Surg. 2003 Dec. 238(6):894-902; discussion 902-5. [Medline]. [Full Text]. Wagle PK, Joshi RM, Mathur SK. Pancreaticoduodenectomy for periampullary carcinoma. Indian J Gastroenterol. 2001 Mar-Apr. 20(2):53-5. [Medline]. Ahn KS, Kang KJ, Kim YH, Lee YS, Cho GB, Kim TS, et al. Impact of preoperative endoscopic cholangiography and biliary drainage in Ampulla of Vater cancer. Surg Oncol. 2018 Mar. 27 (1):82-87. [Medline]. Ahualli J. The double duct sign. Radiology. 2007 Jul. 244 (1):314-5. [Medline]. [Full Text]. Bassi C, et al; International Study Group on Pancreatic Surgery (ISGPS). The 2016 update of the International Study Group (ISGPS) definition and grading of postoperative pancreatic fistula: 11 Years After. Surgery. 2017 Mar. 161 (3):584-591. [Medline]. Kocherization of the duodenum. For ampullary malignancies greater than 1 cm in size, pancreaticoduodenectomy is the preferred operation. This figure demonstrates the process of kocherization of the duodenum. The second and third portions of the duodenum are mobilized en bloc with the periduodenal nodal tissue. The authors prefer to expose the inferior vena cava (IVC) and remove alveolar tissue, which lies above the IVC en bloc with the specimen. Periampullary malignancy. Transected pancreas with head. Pancreaticoduodenectomy is the preferred treatment for most periampullary tumors. This picture depicts transection of the pancreas at the pancreatic neck. This particular patient presented with a periampullary malignancy accompanied by jaundice and pancreatitis. A preoperative pancreatic stent (usually unnecessary) is seen within the pancreatic duct. Carcinoma of the ampulla of Vater. Roux-en-Y reconstruction following completion of a standard pancreaticoduodenectomy. Double duct sign of periampullary cancers. Note the dilated common bile duct as well as the pancreatic duct. Liver metastatic lesion is also seen. Distended gall bladder with double duct sign in a patient with periampullary cancer.